If you've lowered your MINI, you may find that the rear camber is way out of whack and that, depending on how low you went, your wheels may be angled in slightly which puts a lot of wear on the inner edges of the tires (technically called Negative Camber). If you're a racer, this is crucial in order to set the rear camber to suit your driving skills and needs. Besides causing damage to your tires, it looks pretty odd and can wear out wheel bearings pretty quickly. The only way to fix it is the replace the stock rear controls with adjustable arms like these or any of the other adjustable arms that we have in the suspension section. The Mini has 4 (2 each side) rear suspension links that control rear wheel movement and camber. If you install a pair of LOWER adjustable arms on each side you can adjust either the camber and if you need control over toe you will need to replace the upper set as well (MOST applications do NOT require this). -These links use heavy duty urethane bushings. The urethane bushings provide much better control than any rubber bushings, but are still easily streetable. An adequate amount of grease is supplied with each bushing for a sqeak-free drive. 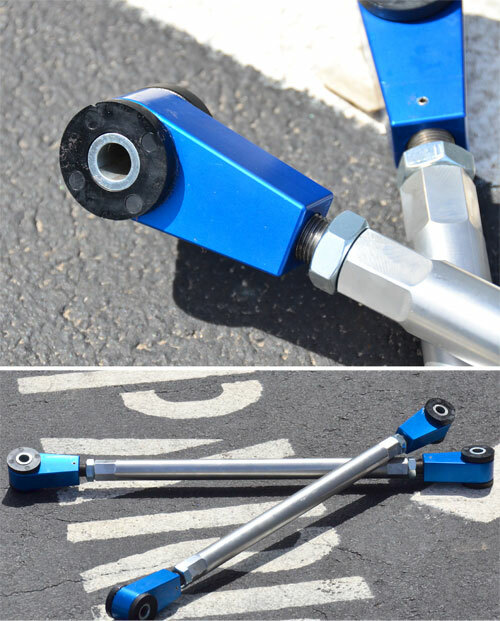 - Arms feature strong billet 6061T6 aluminum end-pieces (not welded tube and bolt). Each end is threaded right or left handed. Adjustment procedure is similar to that for tie rods. -The center bar is heavy wall heat treated aluminum with a hex on the end for easy adjustment. .
- Made right here in the USA. Will fit all new Mini Coopers.